WooCommerce Max Quantity is a plugin for WooCommerce that helps you control your inventory. It let’s you set a maximum quantity limit for each product, per order. This is useful if you want to control your WooCommerce inventory: for example, if you don’t want to let one customer purchase all of your inventory at once. You can read about the WooCommerce Max Quantity features on the plugin’s page. To install the plugin, go to your WordPress dashboard –> Plugins –> Add New. Search for “WooCommerce Max Quantity” to find the plugin. When you see “WooCommerce Max Quantity”, click “Install Now” to install the plugin. 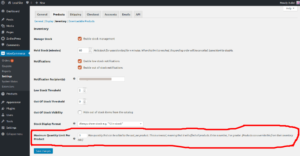 WooCommerce Max Quantity has only two settings. You can use these settings in a variety of ways to accomplish the unique goals of your store. You can use either one setting, or the other, or both. A universal limit means that this limit affects all products in your WooCommerce store. This is the max quantity limit that can be added to the cart, per each product. The universal limit works like this: for example, if you set it to 3, then people can only add a maximum of 3 of each product to their cart. 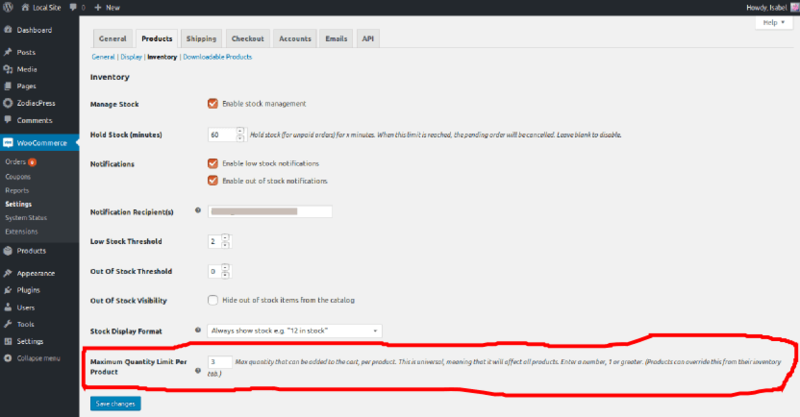 To find this setting, go to WooCommerce -> Settings -> Products tab. Click “Inventory”. Scroll down to “Maximum Quantity Limit Per Product.” Set your desired limit, there. Each product can override this setting from its own product inventory tab (see the next setting). The individual product max limit is a quantity limit that is only set for a single product. This lets you set a different limit for each product. If you set this limit for a product, then that product’s own limit will always override the universal limit. An individual product’s “Max Quantity Per Order” setting. To find this setting for an existing product, go to the product’s own “Edit product” page. (In your WordPress dashboard, go to “Products” then click one of your products to edit it.) (You will also see this setting when adding a new product.) Scroll down to the “Product Data” box. Click on the Inventory tab. There, you’ll see the setting called, “Max Quantity Per Order.” Set your desired max limit for that product, there. You must remember to click “Update” to save your changes. The following examples are meant to explain the possibilities available for putting a limit on quantities because every store has unique needs. WooCommerce Max Quanity helps you control the quantity per order, per each product in several ways. This, in turn, helps you control your inventory. You can set the universal limit to affect all products, and then set the individual product limit for only a few products. The products which have their own limit set will use their own limit, rather than the universal limit. All other products will use the universal limit. You could NOT set a universal limit (just leave it blank). For example, if you don’t want any limit set on most products, and you only want to set a limit on one or two products. You can do that by setting the limits only for those products, individually, and don’t set a universal limit. You could just set the universal limit, and never use the individual product limits. The universal limit will automatically place the limit on all products. There are two types of error messages. One type is a small pop-up message that will appear on the quantity input field if you manually type a number that is too large. If someone tries to manually change the quantity to a number higher than the max, the browser will show a pop up message. These messages are set by the browsers, not by WooCommerce or this plugin. 99 is too many. Please call 555-555-5555 to order more than 5. The other type of error message is controlled by the plugin. This is the main error that will appear at the top of the page after they try to add too many items to the cart. This will usually happen if they already have some items in the cart, and then they try to add more items to exceed the max limit. To customize this error message, you have to add the following small bit of code to your functions. You can edit the message on line 6. The $max variable gives you the maximum quantity allowed. You can use that variable in your error message. * Customize the error message for adding too many items to the cart. If you don’t want to completely replace the error message, but you rather add to the default message, then use one of the following instead. * Insert custom message before the default error message. * Add custom message to the end of the default error message. Here are some points to consider when troubleshooting a problem with this plugin. If you go back and set an individual product limit on an existing product, you must remember to click “Update” to save your changes. Hi! Is there a way to make that the Maximum quantity be defined by the Available stock? For example a universal rule that doesn’t let you add yo cart more than 50% of the current stock? Hi. Not at this time, but I’ve just added that ability to the list of enhancements for the next update. Thanks for the plugin. Is it possible to add max quantity in variable products, in the product variations. Hi. For now, you can add the max quantity to the product. This will be enforced with any variations. But, adding a separate max quantity to each variation is not supported yet. I will add this to a future release. Is this feature available yet or coming real soon? I could really use it! Great thanks for such an easy to use plugin with great functionality. Working fine as expected. thanks for the plugin and moreover, thanks for the code snippets. Really useful and well documented. I want to limit the order to a maximum of 3 items which works great when I set the global value. However if I add more than 1 of the same product it won’t let me. How can I have a global limit of 3 but no limit to individual products? If I understand you correctly, you cannot add more than 1 of the same product to the cart? This means that you probably enabled “Sold individually” for that product. To find the “Sold individually” setting, edit the product, look under “Product data”, then look in the Inventory tab. There, you can disable that setting. Thanks for making this awesome simple plugin. I’ve customised my shop page to show plus/minus buttons for adding products to the basket. Is there a way to hook in the max quantity set in your plugin into the js-code I wrote for these plus/minus buttons (i.e. to show a message when hitting the max amount in the amount selector). your method for changing “Please select a value that is no more than…” worked like a charm !